Home to the City of Peoria Sunrise Mountain Branch Library, and in close proximity to the 101 freeway, Camino A Lago is a wonderful place to buy a home. The Meadows at Camino A Lago is a newer home community that affords homebuyers the choice of newly built homes of various styles and sizes. Meritage, DR Horton, and K Hovnanian homes can all be found within this exceptional community. Camino A Lago residents enjoy close proximity to multiple parks and shopping centers. 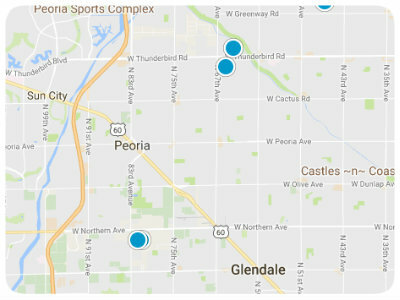 The community also boasts walking paths and has excellent schools, operated by the highly-regarded Peoria Unified School District. This distinguished district recently opened Sunset Heights, its 34th elementary school, which is located adjacent to a new park serving the community. Adding to its appeal, Camino A Lago sits adjacent to Lake Pleasant Parkway which affords residents quick and convenient access to the freeway, making Lake Pleasant just a few minutes drive. This close proximity to the Lake means an abundance of recreational opportunities for Camino A Lago residents, including fishing, boating, canoeing and more. In addition to great recreation options, residents also have great opportunities for shopping, dining, and entertainment. All of these great features make Camino A Lago a must-consider destination for prospective homebuyers in Peoria, Arizona. Meritage homes in Camino A Lago include gorgeous executive homes on oversized lots, as well as affordable family homes. Some Meritage homes have more than 5,000 square feet of living space, though sizes vary and start around 3,000 square feet. DR Horton homes in Camino A Lago typically range from around 1,400 to 3,500 square feet of living space and consist of three series of floor plans, both single-story and two-story. Standard lots in the DR Horton area of Camino A Lago range from 6,600 square feet to well over ¼-acre in size. These sized lots allow for the opportunity to add a play area or swimming pool. K Hovnanian Homes in Camino A Lago ordinarily ranges from around 1,600 to more than 4,000 square feet of living space. They also offer a variety of floorplans to accommodate the needs of most homebuyers. If you would like more information regarding homes for sale in Camino A Lago, please allow us to assist you and contact us today.